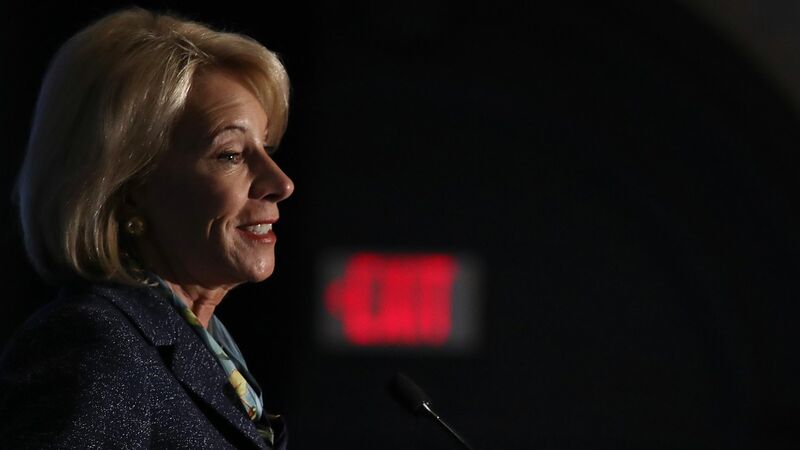 Education Secretary Betsy DeVos wants to scrap Obama-era regulations that stopped giving federal loans to universities if their graduates weren't making enough money to pay them off, the New York Times reports. Why it matters: If successful, it would be the "most drastic in a series of moves she has made to free the for-profit sector from safeguards," per the Times. The safeguards were put in place by the Obama administration after for-profit colleges got tangled in accusations of fraud. DeVos' proposed "gainful employment" rule is believed to be keeping some of Obama's regulations, the Times reports. It would require colleges to publish information in a federal database in order to keep them accountable. Some of the information, including student debt burdens and federal loan repayment rates, is already published on a government website created under the Obama administration called College Scorecard. DeVos used a court ruling in favor of the American Association of Cosmetology Schools against the Education Department to support her decision last year. Per the Times, the association said the Obama regulations were unfair because the graduates were earning income through other sources, including tips, that the department wasn't counting. The other side: President of the National Student Legal Defense Network, Aaron Ament, told the Times that the safeguards "were enacted to protect career college students from being trapped in programs where they incur mounts of debt for little or not benefit. Any attempt to eliminate this common-sense rule is an enormous mistake."